WHICH FORECAST METHOD TO USE? Plans made on no forecast is for example consumption based replenishment – we replenish what we sold in last period. 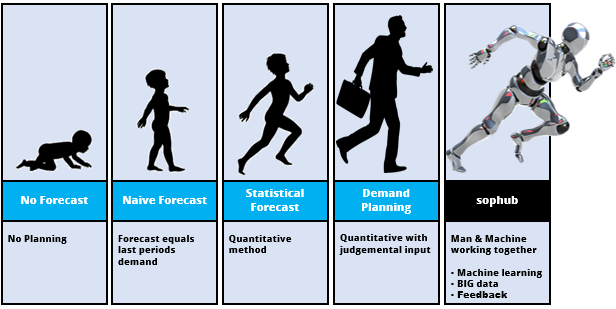 Judgemental estimates are qualitative forecast while statistical forecast is an example on a quantitative forecast. The two later are used when sales in last period is not a good prediction of sales in the future. At sophub we acknowledge the fact that no single method can be superior to another. Instead we identify which method is suited best for each case by using segmentation and machine learning. In some cases a mix of methods provides the best plan. At sophub quantitative forecast is the initial step, and on top judgemental adjustments is added. The mixed method approach is for example relevant in case of random promotion or deals. Here humans can pin point the time slot a promotion/deals is coming and then a machine can generate a estimate on the effect based on promotion type, marketing input, historical effect or a mix of those. An objective quantitative forecast should always be the first step in the forecast process since we then can compare later steps to identify whether we improve or not. An example on an objective starting point is the naive forecast. Naive forecast is the most simple forecast since it is just last period sales. Last period sales is equal to consumption based planning. If our forecast can not beat this simple approach we should not make sophisticated forecasts. In fact our experience and research have showed in average 30% of a port folio can best be predicted by the simple approach, while the last 70% benefits from quantitative forecasts or a mix of quantitative and qualitative methods.